Wagner in his home "Wahnfried" in Bayreuth. Wagner was the first to darken the auditorium during performance, with doors shut to inhibit latecomers from entering, and the first to specify that applause be reserved for the end of an act. He invented stage scenery that moved sideways; founded the modern school of conducting; began a revolution in stage lighting; invented the concept of �leitmotiv�; was the progenitor of the symbolist movement in poetry (inspiring many writers and poets including Joyce, Shaw, D.H. Lawrence, T.S Elliot, Baudelaire, Mallarm�, and Thomas Mann); invented the modern form of opera; was the first to dissuade singers from singing to the audience during a performance; the first to recognize Beethoven�s last great works (including the 9th Symphony); the first to emphasize that singers must act also when singing drama, and the first to create the hidden orchestral pit. He invented new instruments and, as every music theory book states, took harmony to its final destination through new chords, harmonic progressions, and modulation. Finally, unlike other composers of opera, he wrote both the words and the music. Wagner�s signature continual modulation from key to key first occurred in Tannhauser in the famous narrative of Tannhauser in the final act. Lohengrin was the first opera to not have recitative, a standard feature of traditional operas (In traditional operas, recitative sections linked clearly defined �pieces� such as arias (songs), duets, and so on). In Lohengrin, there are few pieces that can be performed as concert selections. Even the famous Dream of Elsa has to be adapted for concert performance, because in the opera, its three sections are separated by interludes. No applause was allowed in Bayreuth after the grail scenes that end the first and last acts of Parsifal. The audience was expected to withdraw in hushed silence. Parsifal, not an opera but a B�hnenweihfestspiel (A stage-consecrating Festival Play), was performed only at Wagner�s own theater in Bayreuth, Germany until 1903, when it�s copyright expired and the Metropolitan Opera in New York produced it against Wagner�s widow�s wishes using a miniature score that Wagner�s publisher Schott released contrary to its agreement with Wagner. In 1872, Clara Schumann, composer Robert Schumann�s wife, called the enthusiasm that the world was then experiencing for Wagner a kind of disease that sweeps across a country and carries away the very best people. Three years later she attended a performance of Tristan und Isolde and called it the most repulsive thing that she had ever experienced in her life. When she attended Rhinegold in 1882, she complained that she felt as if she had been wading around in a swamp. �The boredom one has to endure is dreadful. How prosperity will marvel at an aberration like this spreading all over the world. For her, the opera had one good point�that the brass did not deafen her, as she claimed it had in his other operas. King Ludwig of Bavaria saved Wagner from complete poverty and, against the wishes of the entire government of Bavaria, supported him lavishly, providing the means for the first performance of Tristan und Isolde, a work that had been pronounced unplayable. Wagner moved to Munich to be near the king then became such a subject of daily mockery from the Munich press, that he was forced to move away. Ludwig was loved by the common people of Bavaria, but hated by his own royal staff, who plotted against him, finally trumping up charges of insanity so that they could have him dethroned. Soon after, the king was dead, probably murdered. Yet still today, King Ludwig is referred to as �Mad King Ludwig� the insane monarch of Bavaria who wasted himself on Wagner�s music. The public is still not aware of the trumped up charges that had been made against him over 100 years ago. Ah, should the truth of the events in the lives of Wagner, his wife Cosima, and King Ludwig ever be firmly established in such a way that the people, who are probably not ready for the truth anyway, be properly informed! 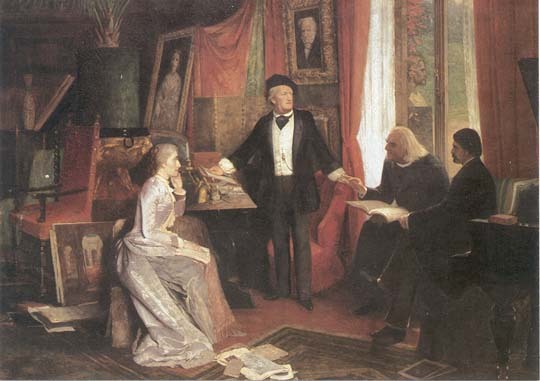 While he was building his theatre in Bayreuth, Wagner was called �The Bavarian Lunatic, Charlatan, The Music-Pope, The Shah of Bayreuth, and The Song Murderer.� However, when the theatre opened in 1876, the following people came to see the Ring: Two emperors (Emperor William I and Dom Pedro of Brazil), a king (Ludwig of Bavaria), three grand dukes, Prince Vladimir of Russia, Prince William of Hessen, and the composers Saint Saens and Eduard Grieg. With the production of the Ring in Wagner�s own specially built theater, Wagner had created an artistic shift of gigantic proportions, and the Ring was the fulfillment of his earlier writings on the �Artwork of the Future.� At the close of the first performance of the Ring, the applause was so tumultuous, that Wagner felt forced to go on stage (one of the innovations he had made at Bayreuth was to not have performers or himself come onto the stage after performances). He said a few words, among which was this comment: �You have seen what we can do. It is now for you to will. And if you will, we shall have an art!� Instead of realizing that they were witnessing an amazing and historical realization of a new kind of art work, the critics took hold of this comment and screamed loudly in the newspapers that egomaniacal Wagner had proclaimed that before HIM there had been no art! These diatribes added to the fire of their infective of continually proclaiming him as an egomaniac. Felix Mendelssohn was highly admired in Germany so much that when Wagner conducted Mendelssohn�s old orchestra in Leipzig, if he did something differently from the way Mendelssohn did it (such as use a different tempo), the orchestra members were very critical. To them, Mendelssohn was always right. They also found fault with Wagner�s conducting of Beethoven�s symphonies from memory, using no score (something even Mendelssohn did not do). Finally some of the musicians convinced Wagner that he should conduct from the score during the actual performance, as they felt it would be a slight to Beethoven not to. Wagner promised them that he would bring a score to that night�s performance. He showed up at the performance, score in hand, and conducted the Beethoven symphony with the score open, turning the pages as they played the work. After the performance, a couple of the musicians who had asked him to bring the score came up to Wagner and congratulated him on the performance and on taking their advice of conducting from the score. However, one of them happened to look at the score still laying on the podium and noticed that it was not the Beethoven Symphony, but it was the score for Rossini�s Barber of Seville that he had been using. Cartoons in Kikeriki on the occasion of Wagner�s Vienna concert on March 1, 1875 show orchestral performers dragging a rake across a harp, playing a screeching cat with a bow, dumping trash into a barrel, sawing wood, and so forth. George Moore said of Wagner�s libretto (never completed as an opera) for Jesus of Nazareth in the �Musician� of May 12, 1897: �There is only one thing to say: viz., that neither Shakespeare nor Sophocles could have contrived a nobler or a more dramatic telling of the story. Quite naturally every incident falls into its place, and advantage is taken of every hint� It is doubtful if Shakespeare would have conceived the opening scene with its massive purpose that marks the opening lines. The beauty of Wagner�s music has shadowed his genius as a writer.� Arthur Drews believed that it was probably no exaggeration to describe Wagner�s version of the life of Jesus as one of the most successful ever written. Wagner was never one to write �occasional� pieces, however he did compose some, including the wonderful Siegfried Idyll. Of his piano pieces, the Wesendonck Sonata, Wagner called �trivial, shallow, and nondescript.� He told Cosima that he had never been able to write an occasional piece. The Albumlief written for Betty Schott he called artificial. �Only the Idyll had been successful,� he said. Verlaine�s Parsifal sonnet first appeared in La Revue Wagnarian on Jan 8, 1886. It was dedicated to Jules Tellier and had been written in 1885. Dans la Revue Wagn�rienne, ce sonnet est accompagn� de sept autres, don�t celui de Mallarm�, qui forment ainsi comme un <<Hommage � Wagner>>. T.S. Elliot a introduit le dernier vers tel quel dans son po�me <<The Waste Land>> (III, the Fire Sermon) au ver 202. �My Richard, O mein Richard, how you have had to fight, how misunderstood you have been! Only future centuries will know how to appreciate you! And you have been my friend.� [�well let�s hope the 21st Century does, as the 20th didn�t]. In the Sihltal in Switzerland Wagner heard forest birds. These went into the �Forest Murmurs� scene in Siegfried: yellowhammer � oboe, oriole � flute, nightingale � clarinet, tree-pipit � flute, blackbird � flute and clarinet. Felix Draeseke, a 24-year-old composer, visited Wagner for a month when Wagner was living in Lucerne. One day Wagner called Draeseke into his room before they went on their usual afternoon walk. � Wait just a minute and Tristan Und Isolde will be finished,� Wagner said to him. Draeseke waited for Wagner to write the last notes. Looking at the score, Draeseke asked why the English horn did not play in the final chord. �Why should that old scoundrel still be grunting away?� Wagner said. Richard Strauss has called that chord �the most beautifully orchestrated B major chord in the history of music.� Draeseke maintained to the end of his life that Wagner�s was the greatest mind he had ever known.